SECRET LIFE OF BILLY THE KID! It’s springtime, a time when one’s fancy turns to love. Teachers, doctors, lawyers, people of all shapes and colours thinking of the more genteel part of life. Including cowboys. 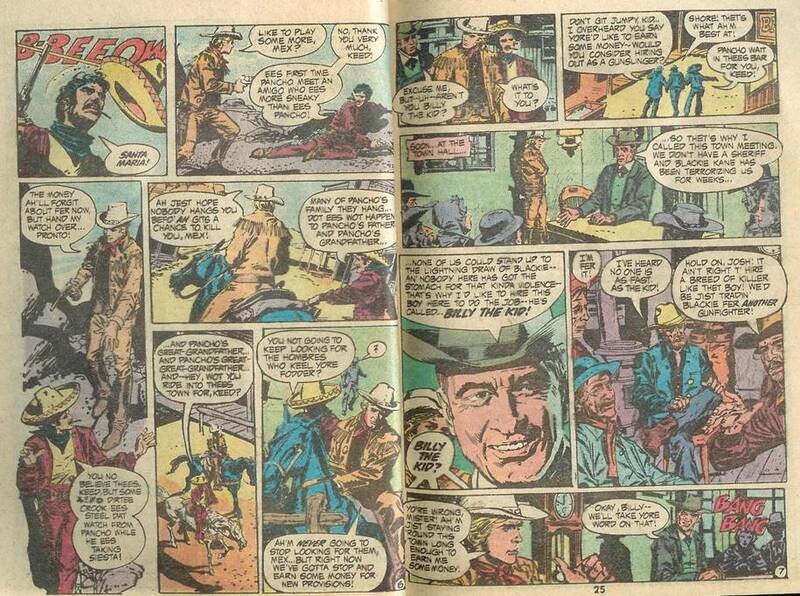 But of course, thanks to a certain movie, people’s perception of the rugged cowboy has changed. 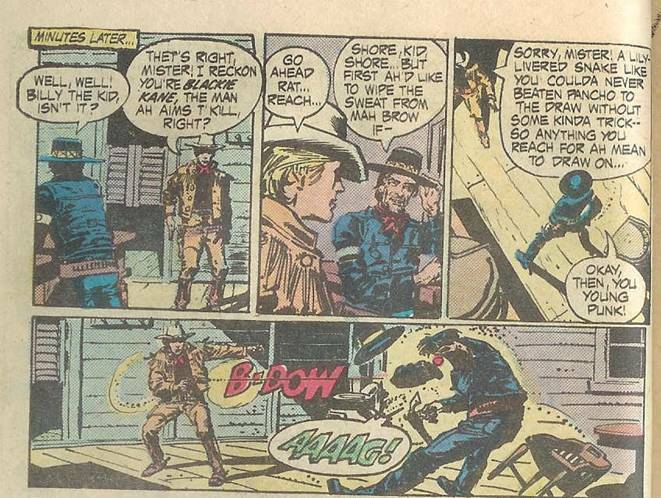 Considered groundbreaking stuff for movies, this theme was, of course, covered in comic books almost 30 years ago, and featured one of the most notorious names of the wild west. So Billy’s hunting down the man who murdered his Pa. Okay, how about we check this one out. Give me a second here while I Google ‘Billy the Kid’. Well, that doesn’t check out. 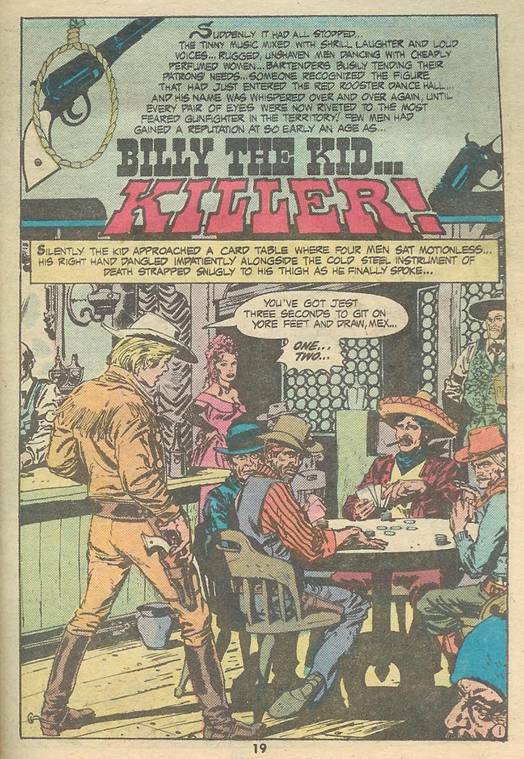 In fact, Billy almost always wore a sombrero, and that doesn’t look like a sombrero to me. 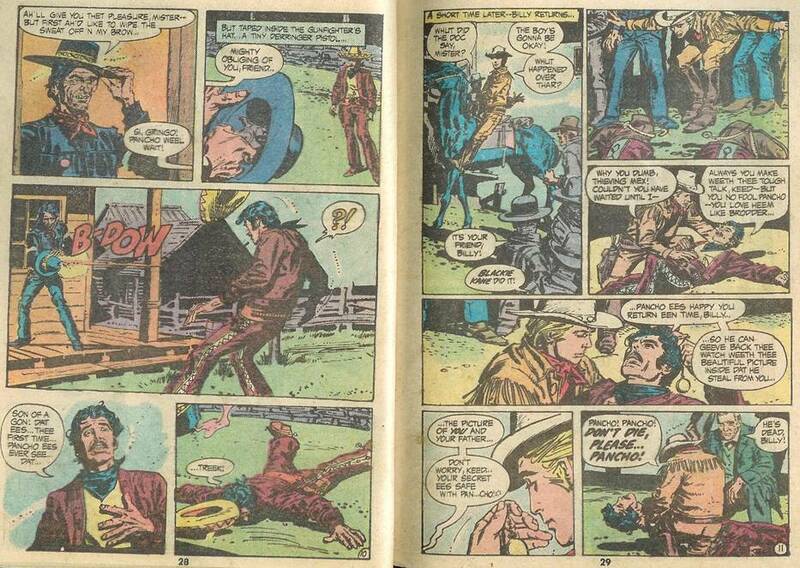 Ah, history comes alive in comic books, doesn’t it? 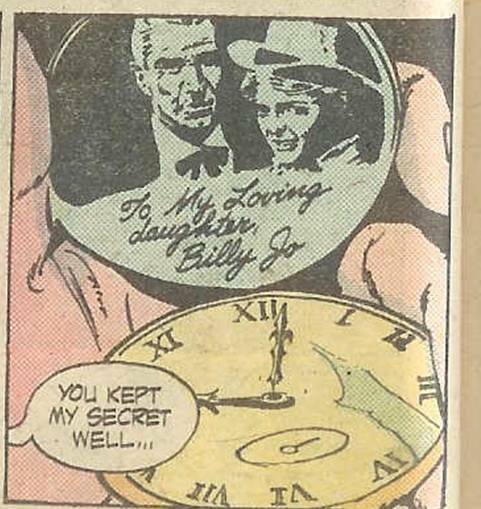 Okay, Billy has a way with women, doesn’t he? Guess times were different, and slapping around blind girls was all the rage. Hey folks, as a special bonus, here’s Lorne Greene in a cameo performance as the town’s mayor! Hooray! Come to think of it, Billy does have a resemblance to Dirk Benedict. All we’d need is Richard Hatch and it’s a quasi-Battlestar Galactica reunion. Now that’s classy! No! They trampled Boxey! J Hands up, both of you, who got that joke. Anyone? Ah forget it. Man, this story has more plot twists than a pretzel (lame, I know, but you work with what you’ve got). 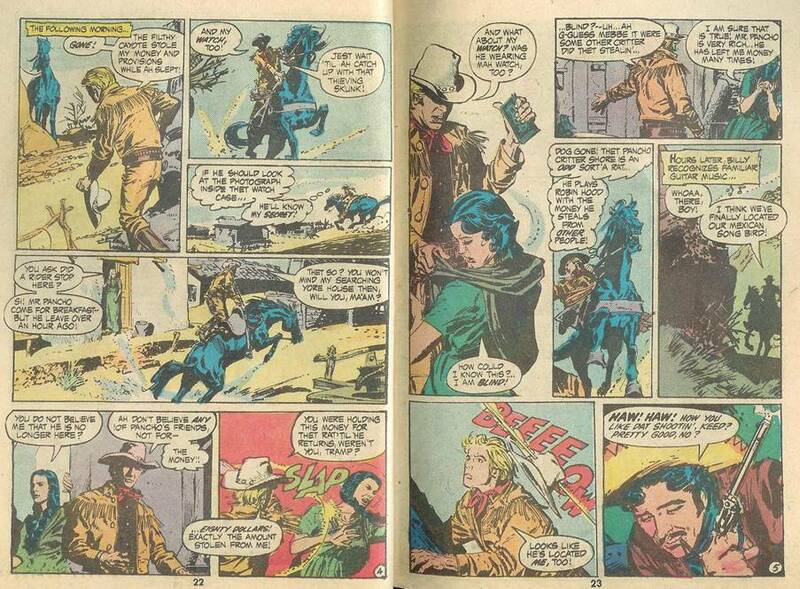 So, Blackie Kane got drunk, took some shots in a saloon that spooked a horse that then trampled a little boy which prompted Billy to ride out for a doctor leaving Pancho to face Blackie Kane. Doesn’t anyone see a problem here? 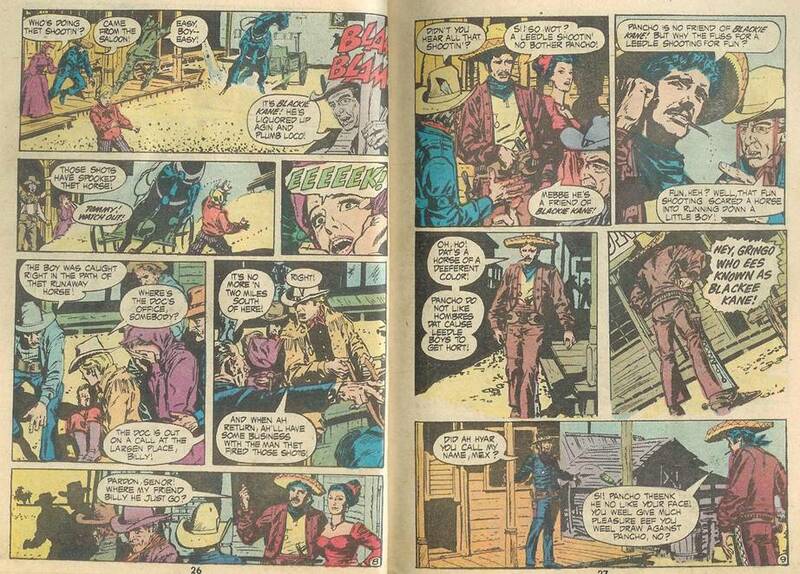 Why would the townsfolk stand around like idiots and let the guy they hired to STOP Blackie Kane ride out? Don’t any of them know how to drive a horse and wagon? It’s alright though, Pancho’s here to save the day! You go Pancho!! Billy sure is broken up by Pancho’s untimely demise, making one wonder what exactly went down their first (I’m guessing) unforgetable night together. 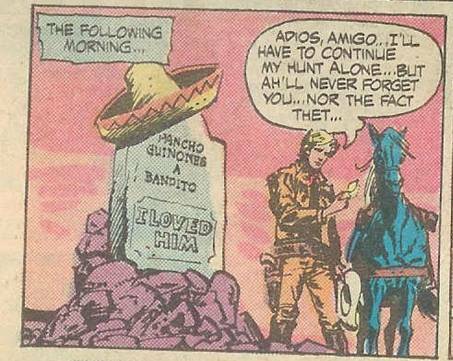 Well, Pancho’s been avenged. Now folks, for the big finale! 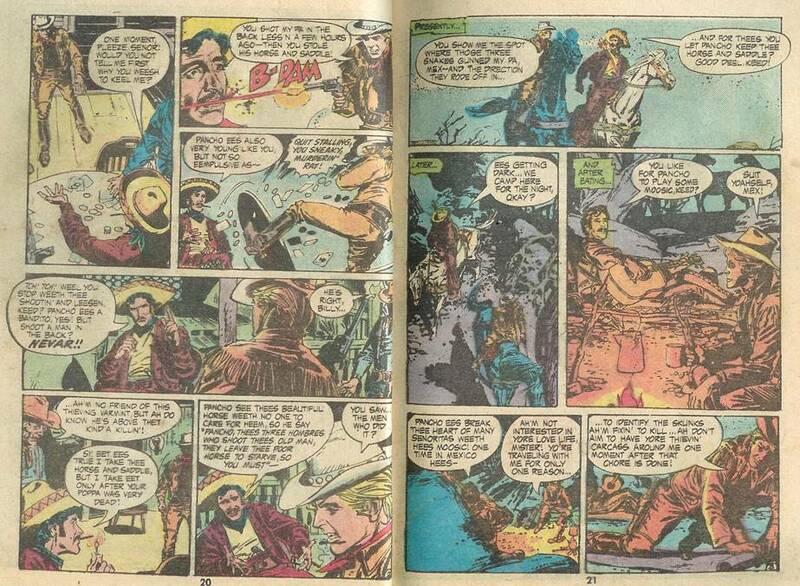 Ah yes, true history comes alive in comic books! Well folks, you have to admit, that’s one heck of a secret! Who knew? Well, that’s it for another installment, time for me to hitting the ol’ dusty trails. Until next time people (or person, judging by my hits counter).